DIGGS, Charles Coles, Jr., a Representative from Michigan; born in Detroit, Wayne County, Mich., December 2, 1922; attended the University of Michigan, Ann Arbor, Mich., 1940-1942; attended Fisk University, Nashville, Tenn., 1942; United States Army, 1943-1945; graduated from Wayne College of Mortuary Science, Detroit, Mich., 1946; licensed mortician and board chairman of the House of Diggs, Inc.; attended Detroit College of Law, 1950; member of the Michigan state senate, 1951-1954; elected as a Democrat to the Eighty-fourth Congress, reelected to the twelve succeeding Congresses and served until his resignation (January 3, 1955-June 3, 1980); censured by the U.S. House of Representatives on July 31, 1979, for multiple convictions of mail fraud and payroll fraud; chairman, Committee on District of Columbia (Ninety-third through Ninety-fifth Congresses); operated a funeral home business in Prince George's County, Md. 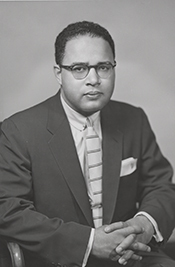 ; died on August 24, 1998, in Washington, D.C.; interment in Detroit Memorial Park East, Warren, Macomb County, Mich.
Charles Coles Diggs, Jr. in Black Americans in Congress, 1870-2007. Prepared under the direction of the Committee on House Administration by the Office of History & Preservation, U. S. House of Representatives. Washington: Government Printing Office, 2008; DuBose, Carolyn. The Untold Story of Charles Diggs: The Public Figure, The Private Man. Arlington, VA: Barton Publishing House, Inc., 1988.